Political unrest and slowing economies have sent investors fleeing the BRICS. 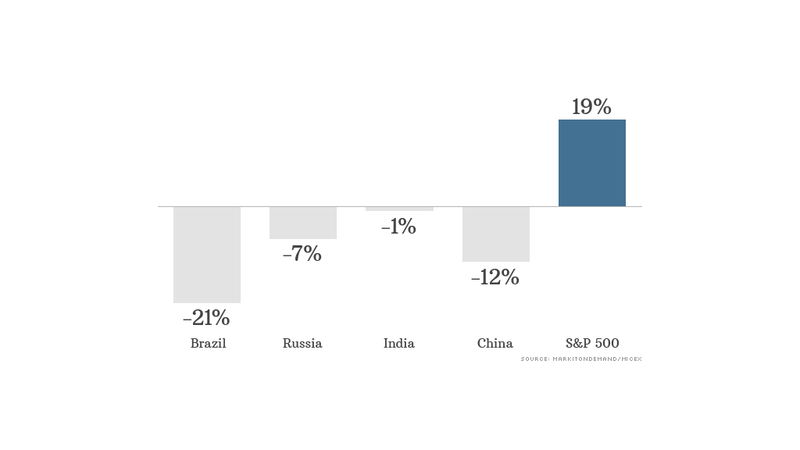 Markets in Brazil, Russia, India and China -- known as the BRICs -- have suffered greatly this year, as troubling economic conditions pushed investors to look elsewhere for returns. Brazil's Bovespa index has been among the world's worst, losing a fifth of its value since January. The Shanghai Composite is down 12%, Russia's Micex is 7% lower and Mumbai's Sensex has declined by 1%. "I would say the BRICs are going through a period of indigestion or perhaps a bit of a hangover," said Sean Darby, chief global equity strategist at Jefferies. "Sometimes the quality of growth produced by rapid development means that subsequent periods aren't all that great." At the same time, markets in the United States, Japan and Europe have gone gangbusters, with many rebounding to levels not seen since before the 2008 financial crisis. Ex-Goldman economic guru Jim O'Neill coined the BRIC acronym in 2001 as a handy way of referring to what he figured were the world's top four emerging economies. Keying off the prediction, asset managers crafted investment strategies based on on the idea that rapid economic growth would translate into robust equity returns. O'Neill was right -- the BRICs have delivered sustained growth, and now account for about 20% of world economic output. And for awhile, BRIC equity funds did extremely well. But pity the investor who thought it would last. The iShares MSCI BRIC ETF (BKF), which includes top companies in all four markets, is down 14% this year, and 27% over the past five. Outflows from BRIC markets in recent months suggest many investors have given up and taken their money elsewhere. There aren't many reasons to be optimistic, considering the significant challenges facing BRIC economies. At the moment, it looks like other emerging markets are in a better position to expand more rapidly. "All of the BRIC economies have structural problems which are likely to prevent significant rebounds in the next couple of years," analysts at Capital Economics recently wrote. "Instead, the turnaround in growth that we expect to see in the emerging world will be driven by the smaller [non-BRIC] economies." In China, GDP growth could drop below 7.5% this year as the government seeks to implement structural reforms. Brazil, meanwhile, has been hit hard by political unrest, and the real has come under pressure. Russia's economy had a bad second quarter as investment slowed and export demand dried up. Despite a tough political environment and stagnant growth, India's economy might have the best prospects of the bunch. The U.S. Federal Reserve has also thrown a wrench into emerging market investment strategies. The Fed has bought some $3 trillion worth of assets since it launched quantitative easing in 2008. Much of that money found its way into stocks in developing economies as investors ventured into riskier assets. When Fed chief Ben Bernanke suggested in May that the bank could soon pull back on those purchases, investors freaked. According to data from HSBC, stocks around the world fell 9% over the next four weeks, while emerging markets lost 16%. The central bank punted in its latest meeting, and did not provide any hints about plans to wind down its stimulus efforts. "I would say that this has to play itself out," Darby said. "It was a seismic shock, but we haven't seen any of the tectonic plates actually move yet. 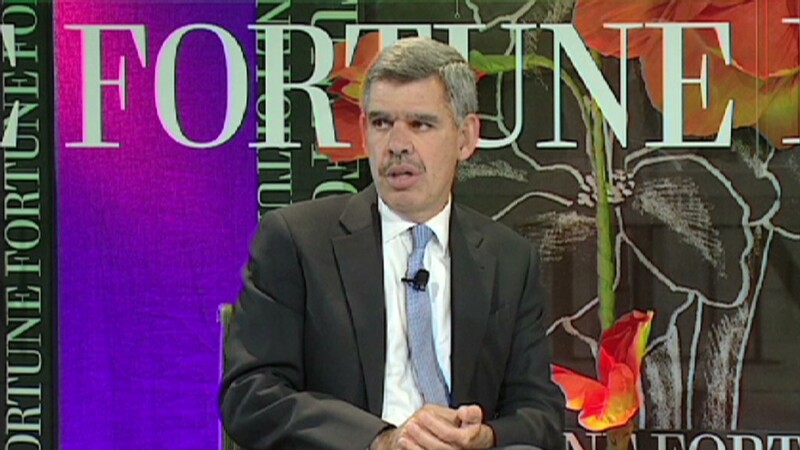 A lot of these markets will have difficulty."